What does it mean to major in art history? Art history is the study of works of art in their historical, social, and political contexts. They obtain knowledge of the monuments and significant artists and artistic periods in Western and non-Western cultures. They take courses in studio art to learn the fundamentals, learn about art theory and criticism, conduct research, and discern the hidden/not-so hidden ideas behind works of art. Art history majors learn about the styles, trends, and developments of art history and gain proficiency with communicating their thoughts about art. Their critical thinking skills can be applied beyond the world of art. Art history majors obtain a general knowledge of the monuments and principal artists of the past in Western and non-Western cultures, as well as in-depth knowledge of selected periods. Additionally, art history majors learn about art theory and criticism, and they conduct art historical research. 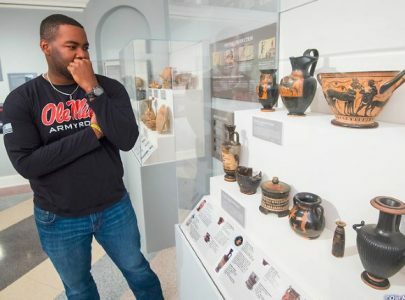 Why is the University of Mississippi a good place to study art history? The 5 art history faculty have areas of specialization in Medieval art history and archaeology, 19th and 20th century American art, African American art, Early Modern Europe, modern art and architecture, postmodern art, theory, and the history & theory of photography. There are also faculty in the Department of Classics and the Department of Sociology and Anthropology who teach cross-listed courses for art history students. The UM Museum houses the David M. Robinson Collection of Greek and Roman antiquities, one of the finest collections of its kind in the United States. Covering the period from 800 B.C. to around 300 A.D., the collection contains Greek and Roman sculpture, Greek decorated pottery, inscriptions, architectural fragments, inscribed Sumerian clay tablets, small artifacts in terracotta and bronze, Roman copies of Greek art works, ancient surgical instruments, and Greek and Roman coins. Dr. Nancy Wicker, Professor of Art History and recent National Humanities Center Fellow, earned her Ph.D. from the University of Minnesota. She has an interdisciplinary research focus on the art of Scandinavia during the Early Medieval Period, from the Migration Period of the 5th and 6th centuries through the Viking Age. One current project is Project Andvari, an online database to facilitate access to digital collections of art and artifacts. Art historians, literary scholars, archaeologists, and museum professionals from the UK, Denmark, Norway, Sweden, Germany, and US developed the system with grant assistance from the U.S. National Endowment for the Humanities. The project presents a constructive solution to the problematic issues of access and information-sharing that result from the nearly overwhelming explosion of digital resources that are now available. What can art history majors do after graduation? A liberal arts education empowers and prepares students to deal with complexity and change through a broad knowledge of the world. They gain key skills in communication, problem-solving, and working with a diverse group of people. Related careers in art history include museum curator or educator, art critic or appraiser, or university teaching. Mattie used her internship at the UM Museum to prepare for a museum career. 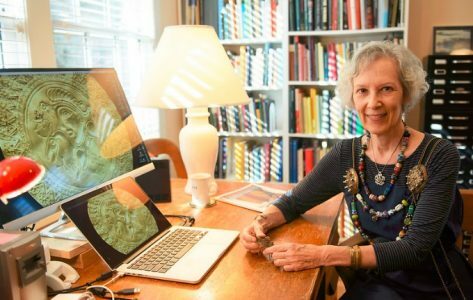 She curated an exhibit of Southern Folk Art including artist research, choosing the pieces to illustrate their style, and designing the exhibit. She later worked as the assistant to the curator and interned at the Ohr-O’Keefe Museum of Art in Biloxi. After earning her M.A. in Art History with a specialization in Museum Studies at Florida State University, she worked at the Mission San Luis Archaeological Site in Tallahassee, FL. 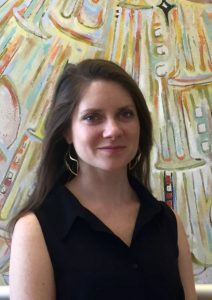 Mattie is now the Director of Collections and Exhibitions of Ocean Springs’ Walter Anderson Museum of Art. Whom should I contact to learn more about majoring in art history?